I feel that every holiday is a perfect excuse for a party. I love parties and I love holidays. So I combine them any chance I can get. I decided to do a kid's party for Halloween this year. It was a pretty relaxed party. I have been very overwhelmed with work lately. So I did not want to put to much on my plate, but I wanted the kids to have fun. So when I say that this party is easy to pull off I mean it. 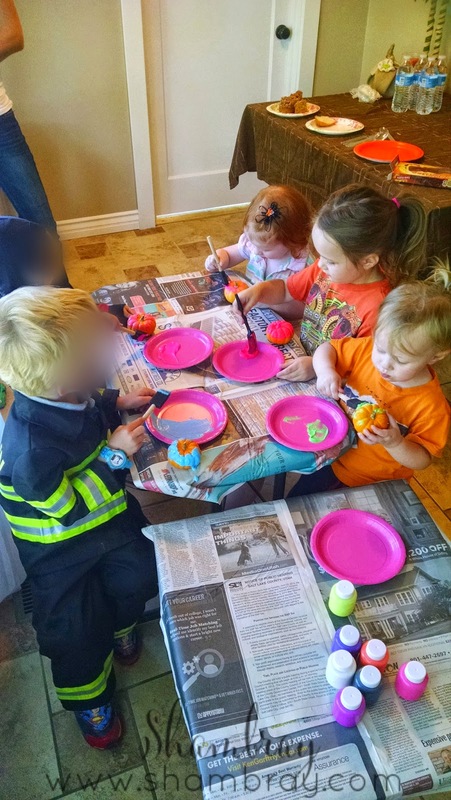 It was quick and easy, but the kids had a blast. That is who the party was for so I was happy. First off, I sent out the invitation. I whipped up something really fast that Hannelore LOVED. She loved all the little icons. So we had to pick all of them. Hey this party is for her. So who could object. Next, I used decorations around my house for the table. Since my house was already decorated for Halloween this was really really easy. So as long as you have decor already out for Halloween then consider that step done. Seriously, it took me less than 5 minutes. Next, was the food. Again, it was super simple, but the kids loved it. I put together the olive, carrot, and celery pumpkin in about 3 minutes. If you are more daring than me you can make a better face than just a smiley face for the jack-o-lantern. It crossed my mind, but I kept telling myself to keep it simple. The pudding cups were so fun, but extra easy. 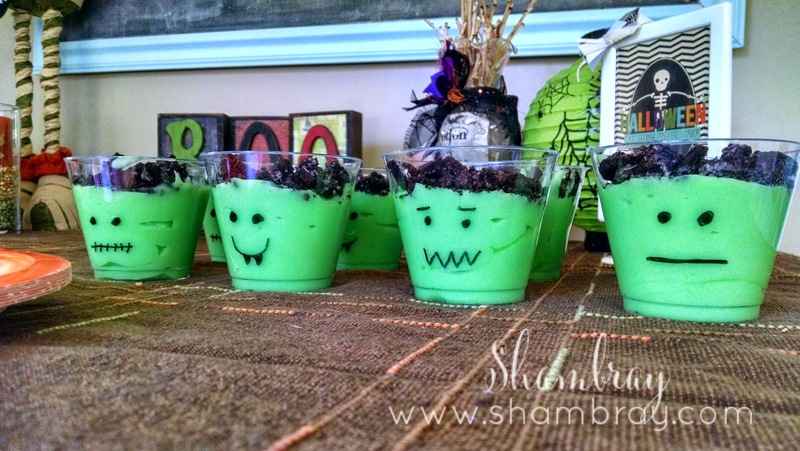 All you have to do is whip up vanilla pudding with green food coloring in it. Then crush up some Oreos. Next, draw a face of your choosing on the cups and fill each cup up with the pudding. Last, top all pudding cups with the Oreo "hair". Last, but not least...these are my daughters favorite. 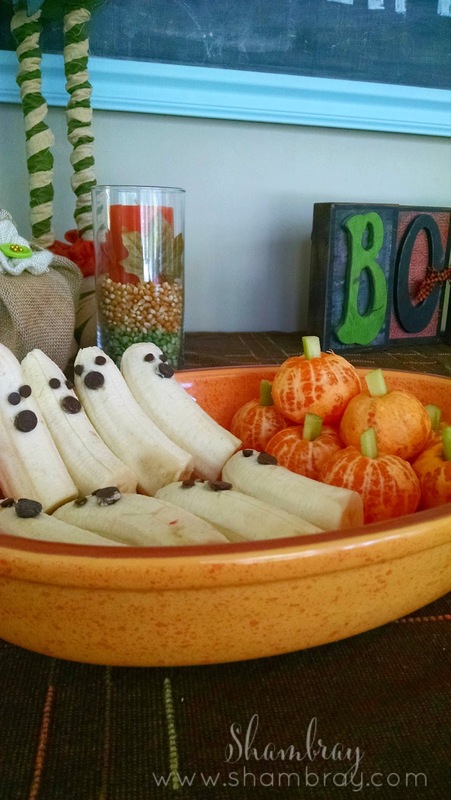 The ghost bananas and the orange pumpkins. 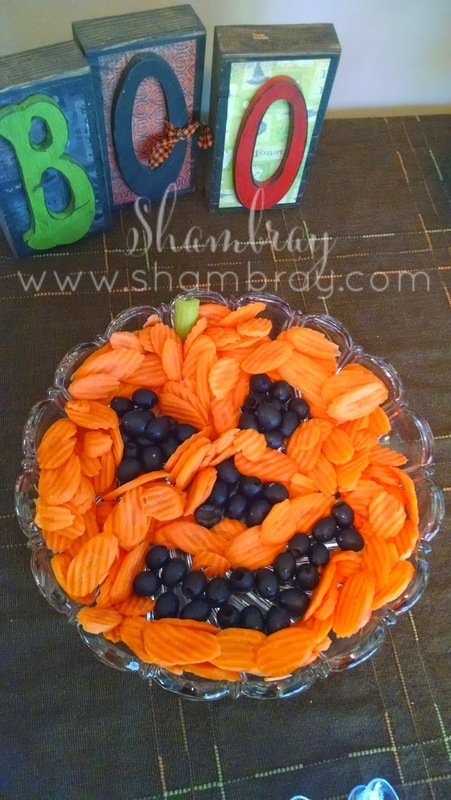 For the pumpkins you just peel each little cutie and then stick a sliver of a celery stick in the top. The ghosts were just as easy. You just cut each banana in half and put 2 mini chocolate chips in for the eyes and one normal sized chocolate chip in for the mouth. Honestly, all the food prep took me less than 15 minutes total! So simple, but so fun for the kids. 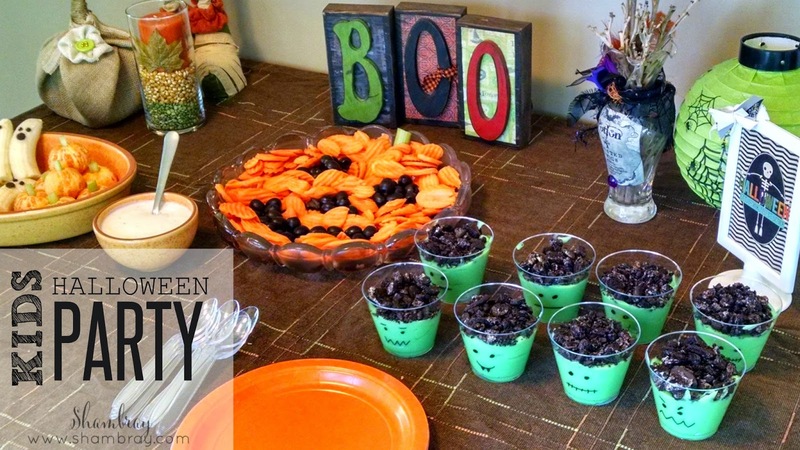 I rounded up all these ideas off of Pinterest. I love having my own ideas, but for this party I wanted simple and quick. So I went with these. Check out my inspiration websites: here, here, and here. The kids each brought something to eat too. So there was plenty to eat. When the kids showed up we ate right away. We went into Hannelore's play room and ate on a big blanket. We ate on the floor picnic style. While we ate we watched Room on the Broom. Okay that movie is so cute. I love watching it just as much as Hannelore does. Then we took pictures of all the kids in their costumes. 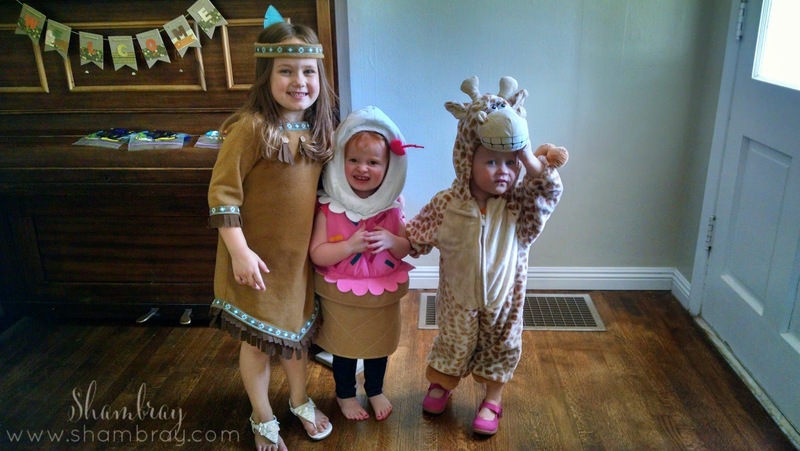 You cannot forget to get a picture in the costumes! They live for those things. Meet Hannelore's "smile" We are missing a fireman and a Ninja from this picture! 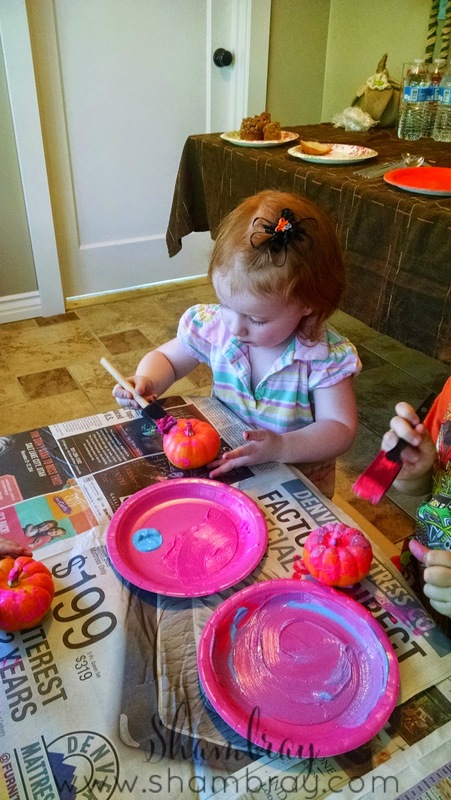 We finished the party with the kids painting mini pumpkins. They loved this part the best. They were so cute. Every one of them was so different in how they painted, but they were all so serious in their painting. Then they got to take the pumpkins home! That was the best part! Let me tell you. 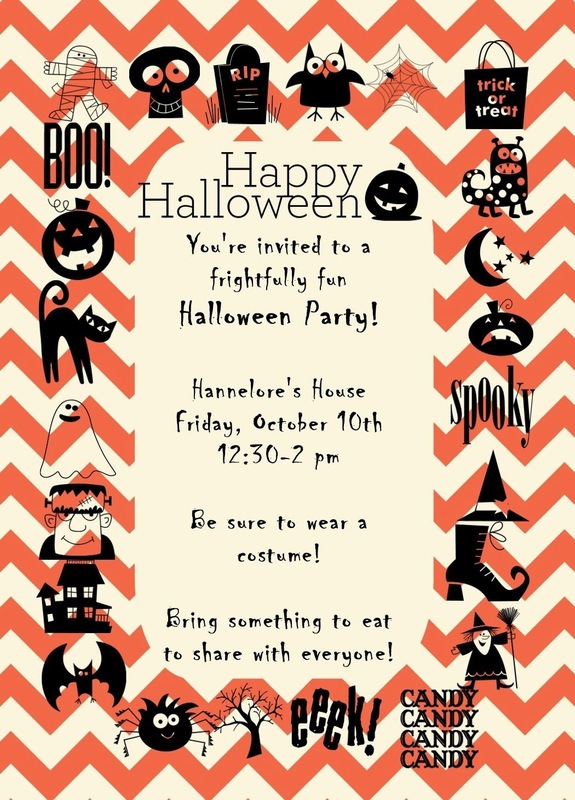 If you are wanting to do a Halloween party I promise you can throw this party together so fast and let your kids have fun at the same time. It is a win-win for mommy and kiddie! Sounds perfect to me! So fun. Your hands are gifted at making food into fun things. Thank you so much for the kind words. You are so supportive and it means a lot to me! Thank you. I really tried to make it easy because...well I have no time right now in my life. Thanks for the kind words! It means a lot coming from such a talented person like yourself! It was. 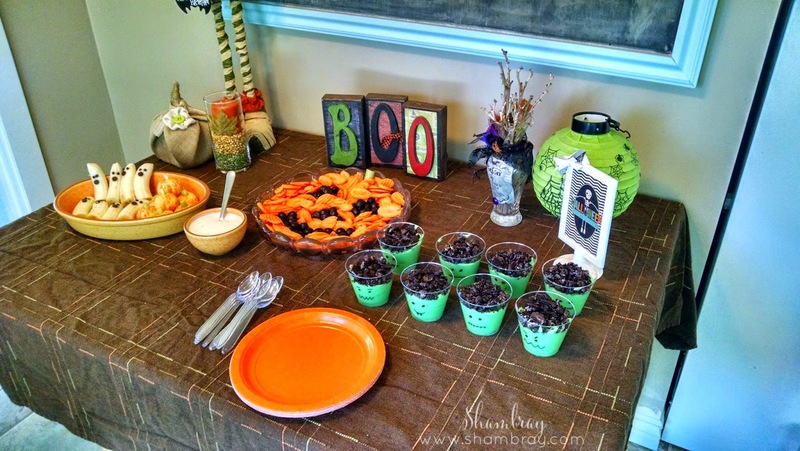 The kids LOVED the food! . Thank you! The food was a hit with the kids. They were enthralled!